This snagging guide will allow you to carry out your snagging inspection in a methodological fashion without requiring any specialist knowledge ensuring that defects are identified as early as possible in the new build home purchasing process. This is extremely beneficial, especially if the defects can be identified and fixed before you move in. If you were able to manage this you would not have to worry about arranging for workmen to access your property, you would not have to spend time and energy chasing the developer to get problems resolved and you would be able to start to fully enjoy your new house and would have a lot less stress in your life. Unfortunately, this is unlikely, but this document will help you strive towards this goal. Snagging inspections are not cheap, so you will be saving yourself a considerable amount of money by doing it yourself with this snagging checklist. If you don’t feel very confident, you can use our own value snagging inspection service. If you would prefer a full service snagging inspection, then try New Build Inspections. 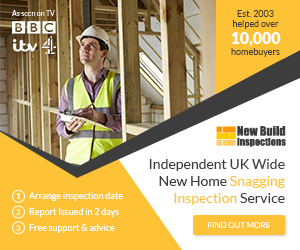 They provide snagging inspections throughout the UK and Ireland. Remember, if you don’t find any snags with our checklist, you can have your money back. Nobody has asked us to do this since we started this service in March 2004! Click here to see an extract. The Snagging Guide is a 190k PDF document. It will download in a few seconds with a broadband connection. Good luck with your snagging inspection and don’t forget to use our snagging forum if you have any questions. The Snagging Guide has been used successfully by new build buyers across Europe. Alternatively, you can get the Snagging Guide for FREE by clicking on the following button. It will take about 10 minuted to complete the offers and get the DIY guide for free via an immediate download. These might include signing up for a free postal DVD rental service or checking your credit file. I’m sure that as a direct result of the format and thoroughness of your guide all my snaggings have been fixed or are in progress. So I would recommend both your snagging list as an essential investment and also recommend Robertson Homes Ltd (Robertson Construction Ltd) for the speed of response and high level of customer service in fixing any snagging. I found this excellent to use – I can be very pedantic about things at the best of times and there’s no way I would have been able to successfully complete my snagging without the help of this really well laid out checklist. It’s very methodical and there was no issue telling my foreman i wanted access to my place for a few hours to be able to run through everything on my own. The builders actioned everything on my list and didn’t remark on any of it. I’d highly recommend this to someone who wants to get fully involved in the purchase of their own home, you get a great sense of satisfaction. Good luck to futures purchasers of this checklist!! My Site Manager smirked at my thick folder & report when I arrived on site, but did not smirk much when I found that 4 lounge patio doors did not open more than a few inches and scraped both window sills in the process, and when I refused to sign his demo sheet until I had spent several more hours with my report! He has been a bit more friendly since and has started to fix things so that they don’t appear on his demo sheet! Most of it has been fixed or is being fixed prior to completion which would have never happened or been known about without your report! Best £15 I ever spent! Whilst I am yet to use the snagging guide, first impressions are impressive. At 55 pages long there are elements in here that I would have completely overlooked (or not thought they were that big an issue). I’m moving in to a new home in Milton Keynes in August where the list will be used in anger …. hopefully there will not be many snags. For my first new home I had no such list. Although I must say the house only had a few minor snags that were fixed within 1 month of moving in. I’m guessing i’ll be lucky to have the same experience twice! I’ve read through the guide already and it’s given me food for thought. It’s perhaps not definitive, but there’s plenty on there to warrant the price! It does give me some confidence I’m not letting things slide that I am entitled to ask to be fixed. (About 3 weeks to go to moving, so expecting to snag some time in the next week or 2). needed to look for. We picked up several things that we would have probably have missed without the list. It also gave us confidence to pick up on things which we may have left in fear of appearing ‘too picky’! It’s a great tool and I have already recommended it to friends.